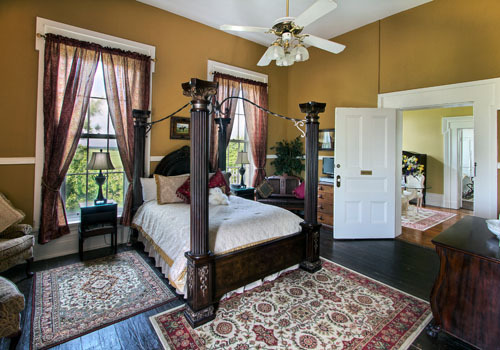 This regal, antique-appointed and spacious room features a grand, Romanesque-style wrought-iron canopy queen bed. It includes a 7-layer Blissful bed with deluxe fiberbed topper and luxurious 600-thread count Egyptian Cotton linens. There is a gas-log fireplace for added romantic ambiance and relaxing comfort. Three 9′ windows overlook the neighboring race horse farm, our Alpaca and Llama Fields, and the all-white flowering, “Butterfly Moon Garden” which glows at night. 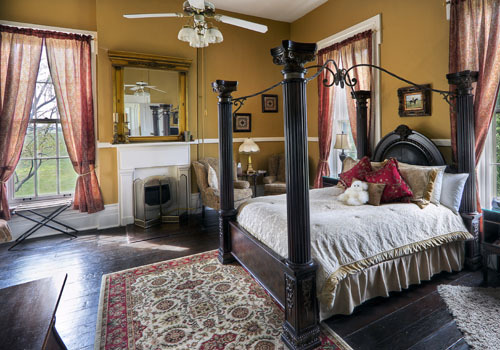 Elegant renovations and remarkable scenic views make this a truly romantic room for a wonderful, lasting memory! Full-size Roll-away Bed available for additional Guests. $35/Adult or $20/Child 12 years or younger.